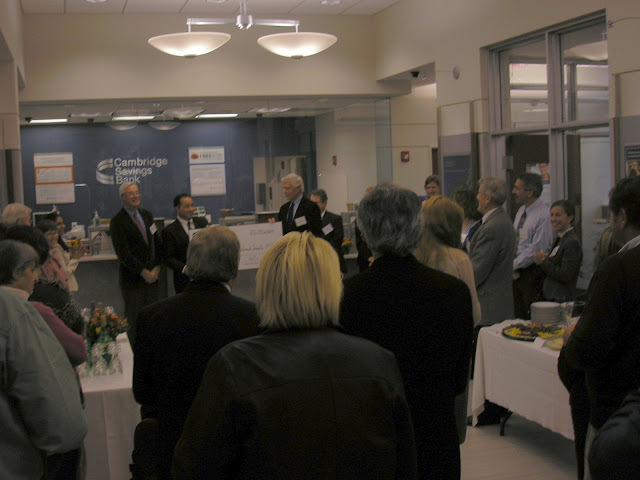 Cambridge Savings Bank which opened at it's new location at 181 Great Road on October 5th, had it's grand opening celebration today. The new location (which is approximately the same size as the old location at Bedford Marketplace) has added Safety Deposit Boxes and a Drive Thru. Inside the branch, it features a very modern airy look that seems more upscale than the other banks in town.. The branch also added an automatic coin counter that's free for Cambridge Savings Bank customers to use. As part of the Grand Opening, Cambridge Savings Bank President and Chief Executive Officer Robert Wilson presents a check to the Bedford Historical Society. 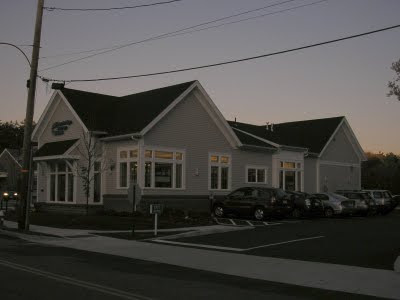 Cambridge Savings Bank which just had it's 175th Birthday, has operated in Bedford since 1943.